One of Sinfotech's missions is its engagement in anti-countefeiting, especially about Made in Italy. 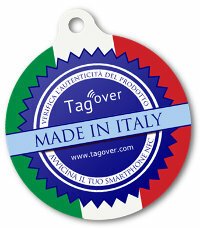 Thus, we developed a system to check the authenticity of important products, by using an NFC smartphone: Tag Over. Tag Over can be applied to different types of products. Protection of food: think about all PGI products, such as Parmigiano Reggiano or buffalo mozzarella; these are products whose authenticity is critical, and whose infringement can be particularly harmful. Protection of high-quality wines: as for food, even the protection of the wines, especially those with Registered Designation of Origin, is very important, in particular in Italy, with its vineyards and its great history of wine-growers and producers of wines of excellence. Protection of luxury products: ensuring the authenticity of great value objects (jewelery, watches, etc.) is absolutely important. Protection of fashion and design products: fashion and design articles are unfortunately very often victim of counterfeiting, which is why they require a certification of their authenticity. We have created special Tag Over Labels, designed for anti-counterfeiting, to be applied to products, equipped with NFC tags. Tag Over takes advantage of a particular feature of NFC Tag, namely the fact that each of those comes with a unique serial number (called UID, Unique ID) that cannot be falsified. By pairing this number to a particular product, you can create a database of certified products, not subject to counterfeiting. We said that products with a Tag Over label are certified as authentic, but how can consumers verify the authenticity? In a very simple way. Anyone with a device (phone or tablet) equipped with NFC can verify the authenticity of the product through a special application: Label Tracking. Label Tracking is a completely free applicatione which, once installed, you can just open it and put your device close to the label. Label Tracking will verify in real time wheter the product is included into the database. If so, a confirmation message will be displayed, complete with a product page, containing product's features and registered manufacturer. If not, you will be warned on the possible counterfeiting of the product. The application requires a working internet connection. Through the product page, you can also share the product page with friends by email or on social networks as well as access other similar products of the same company, with the possibility of directly buying them. Thus, Tag Over label is also a marketing tool, able to bring direct revenue and more visits to your site.